1. Using DOS, follow old well known rules. 2. Using Windows: use the hyper terminal. Use the following information: Direct to com-1. 9600 bd, 8 bits, no parity, stop bit 1, flow control Xon/Xoff. 4. 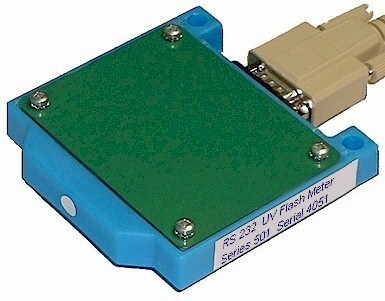 Using USB to RS232 to USB connections are available on the market. Connect +5 Volts from USB into pin No. 9 in RS 232. 2. Follow instructions for the RS 232. Hohner calibrates the values to microwatt / square cm. To recalibrate simply use a calibration light or calibrate to any value . You always can use the values from the sensor as default. You can calculate the new values or put the formula in your Palm software. Figure 1: Spectral Intensity of UV and visible light calibrated to 100 milli watt / square cm for max output.